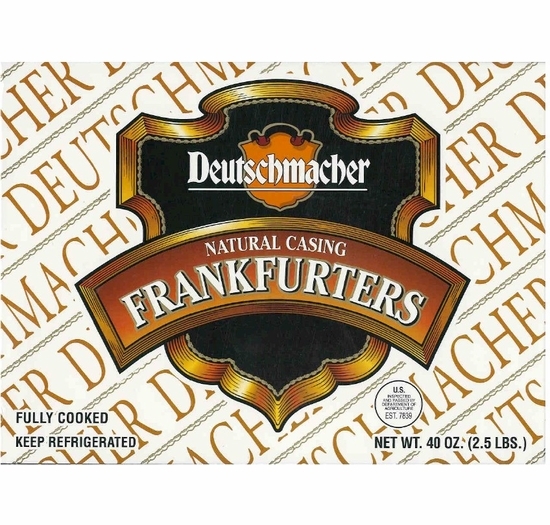 Deutschmacher Frankfurters Natural Casing 2.5 lbs. Home / Pantry Items / Meats & Seafood / Hot Dogs / Deutschmacher Frankfurters Natural Casing 2.5 lbs. 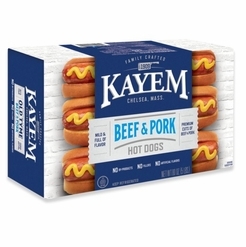 Home / New England Classics / Meats & Seafood / Hot Dogs / Deutschmacher Frankfurters Natural Casing 2.5 lbs. Home / Hot GIFT Ideas / Gifts For Him / Meats & Seafood / Hot Dogs / Deutschmacher Frankfurters Natural Casing 2.5 lbs. 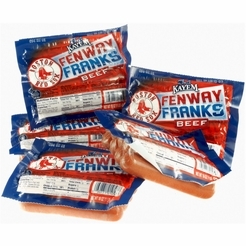 Home / Foods of New England / Meats & Seafood / Hot Dogs / Deutschmacher Frankfurters Natural Casing 2.5 lbs. Home / Meats & Seafood / Hot Dogs / Deutschmacher Frankfurters Natural Casing 2.5 lbs. Home / Specialty Grocery / Meats & Seafood / Hot Dogs / Deutschmacher Frankfurters Natural Casing 2.5 lbs. Home / Hot GIFT Ideas / Gifts For Him / Party Favorites / Meats & Seafood / Hot Dogs / Deutschmacher Frankfurters Natural Casing 2.5 lbs. Home / Pantry Items / Meats & Seafood / Meat & Refrigerated Food Brands / Deutschmacher / Deutschmacher Frankfurters Natural Casing 2.5 lbs. 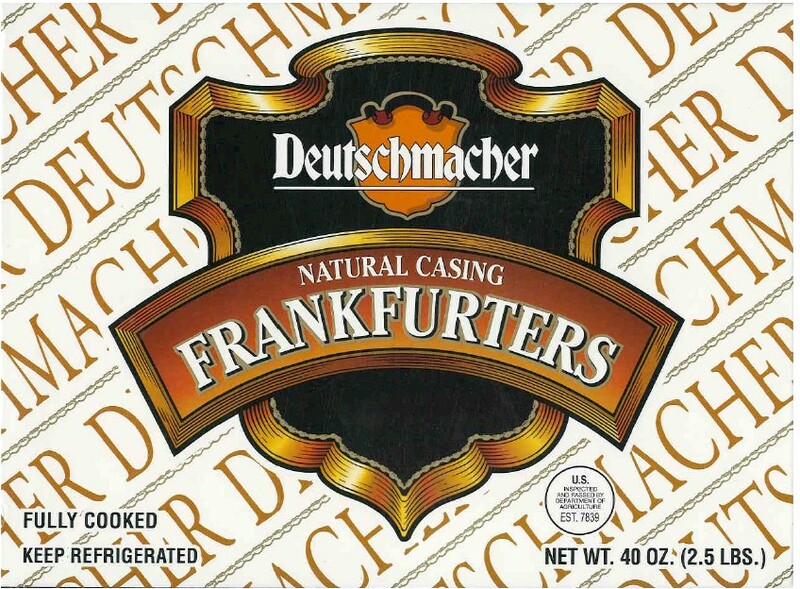 Home / New England Classics / Meats & Seafood / Meat & Refrigerated Food Brands / Deutschmacher / Deutschmacher Frankfurters Natural Casing 2.5 lbs. Home / Hot GIFT Ideas / Gifts For Him / Meats & Seafood / Meat & Refrigerated Food Brands / Deutschmacher / Deutschmacher Frankfurters Natural Casing 2.5 lbs. Home / Foods of New England / Meats & Seafood / Meat & Refrigerated Food Brands / Deutschmacher / Deutschmacher Frankfurters Natural Casing 2.5 lbs. 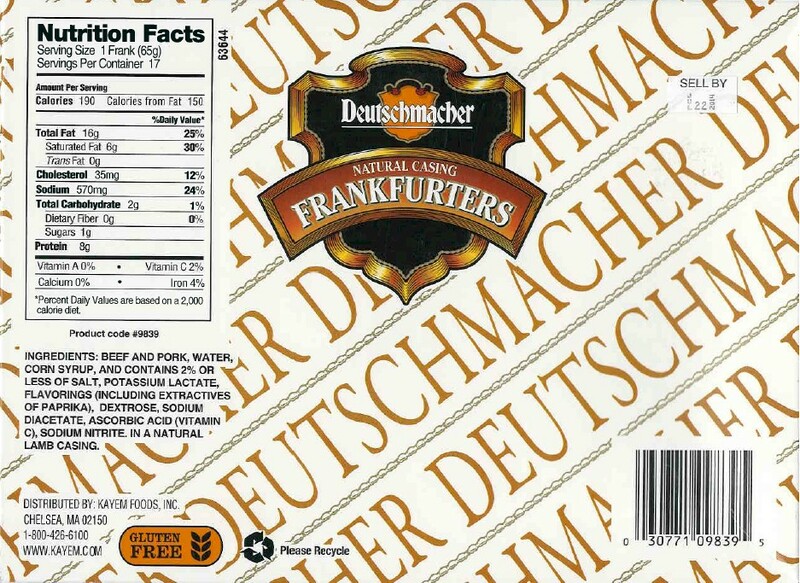 Home / Meats & Seafood / Meat & Refrigerated Food Brands / Deutschmacher / Deutschmacher Frankfurters Natural Casing 2.5 lbs. Home / Specialty Grocery / Meats & Seafood / Meat & Refrigerated Food Brands / Deutschmacher / Deutschmacher Frankfurters Natural Casing 2.5 lbs. Home / Hot GIFT Ideas / Gifts For Him / Party Favorites / Meats & Seafood / Meat & Refrigerated Food Brands / Deutschmacher / Deutschmacher Frankfurters Natural Casing 2.5 lbs. Home / Popular Brands / Deutschmacher / Deutschmacher Frankfurters Natural Casing 2.5 lbs. Home / BBQ & Grilling / Meats & Breads for Grilling / Deutschmacher Frankfurters Natural Casing 2.5 lbs. Home / Hot GIFT Ideas / BBQ & Grilling / Meats & Breads for Grilling / Deutschmacher Frankfurters Natural Casing 2.5 lbs. Home / Hot GIFT Ideas / Gifts For Him / Party Favorites / BBQ & Grilling / Meats & Breads for Grilling / Deutschmacher Frankfurters Natural Casing 2.5 lbs. Home / New England Classics / Clambake & Seafood / Meats & Breads for Grilling / Deutschmacher Frankfurters Natural Casing 2.5 lbs. Home / Foods of New England / Clambake & Seafood / Meats & Breads for Grilling / Deutschmacher Frankfurters Natural Casing 2.5 lbs. Home / BBQ & Grilling / Clambake & Seafood / Meats & Breads for Grilling / Deutschmacher Frankfurters Natural Casing 2.5 lbs. Home / Hot GIFT Ideas / BBQ & Grilling / Clambake & Seafood / Meats & Breads for Grilling / Deutschmacher Frankfurters Natural Casing 2.5 lbs. Home / Hot GIFT Ideas / Gifts For Him / Party Favorites / BBQ & Grilling / Clambake & Seafood / Meats & Breads for Grilling / Deutschmacher Frankfurters Natural Casing 2.5 lbs. 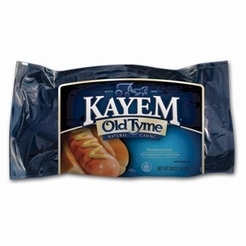 Home / Pantry Items / Hometown Food Favorites / Meats & Breads for Grilling / Deutschmacher Frankfurters Natural Casing 2.5 lbs. Home / New England Classics / Hometown Food Favorites / Meats & Breads for Grilling / Deutschmacher Frankfurters Natural Casing 2.5 lbs. Home / Foods of New England / Hometown Food Favorites / Meats & Breads for Grilling / Deutschmacher Frankfurters Natural Casing 2.5 lbs. Home / Specialty Grocery / Hometown Food Favorites / Meats & Breads for Grilling / Deutschmacher Frankfurters Natural Casing 2.5 lbs. Home / Local Portuguese Foods / Hometown Food Favorites / Meats & Breads for Grilling / Deutschmacher Frankfurters Natural Casing 2.5 lbs. Home / Pantry Items / Global Favorites / Local Portuguese Foods / Hometown Food Favorites / Meats & Breads for Grilling / Deutschmacher Frankfurters Natural Casing 2.5 lbs. Home / Specialty Grocery / Global Favorites / Local Portuguese Foods / Hometown Food Favorites / Meats & Breads for Grilling / Deutschmacher Frankfurters Natural Casing 2.5 lbs. Home / Foods of New England / Local Portuguese Foods / Hometown Food Favorites / Meats & Breads for Grilling / Deutschmacher Frankfurters Natural Casing 2.5 lbs. Ingredients: beef and pork, water, corn syrup, and contains 2% or less of salt, potassium lactate, flavorings (including extractives of paprika, dextrose, sodium diacetate, ascorbic acid (Vitamin C), sodium nitrite in a natural lamb casing. Our Standard shipping method is UPS 2-Day to insure that Deutschmacher franks arrive to your destination within 48 hours. If your area of the country continues to experience warm weather, we strongly recommend you choose the UPS NEXT DAY shipping option. Please keep in mind that with the UPS-2 Day method, we only ship on Monday, Tuesday and Wednesday to insure your order arrives by Friday and does not get hung up in transit over a weekend period. Your order is shipped in super insulated boxes with sufficient cold packs to keep your order cool during the entire shipment. Please note that we are NOT able to process INTERNET orders to PO Boxes OR areas outside the continental US (48 states). * Please note that we are not responsible for delays in shipment outside of our control (i.e. snow), an incorrect shipping address, or if you are not available to accept your delivery. Meat orders cannot be gift wrapped. If your area is experiencing extreme heat conditions, we recommend the NEXT DAY shipping option or postpone your order until cooler conditions prevail. 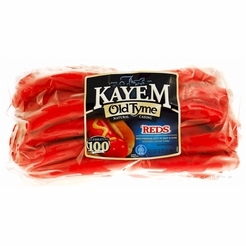 Kayem Old Tyme Natural Casing Franks 5 LBS. 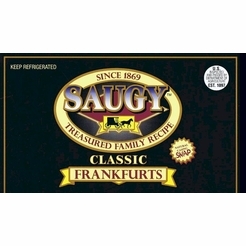 Saugy Frankfurts Natural Casing Gluten Free 5 LBS.